So... I finally got around to finishing a few things off with the Portrait Picker. And here's the first official launch! BG1EE+SOD (non-scaled) and BG2EE = For v2.3 of the games you will need to make one slight amendment to ensure compatibility. After installing as per the instructions - go in to the UI.menu file in a text editor and search for 'rectangle 5' ... there should be only one instance in the whole file. Change this to 'rectangle 6'. Thanks to everyone that's helped me along the way! I really appreciate it. To make the most of the portrait picker you will need to edit the M_BG.lua and M_nicks.lua files manually with descriptions. This does not need to be done straight away. If there are any questions, suggestions, or problems, please let me know! To Install: Just download Portrait Picker v1 .zip and follow the instructions. Guys, you absolutely have to try this! I tested it myself and the result is GREAT! 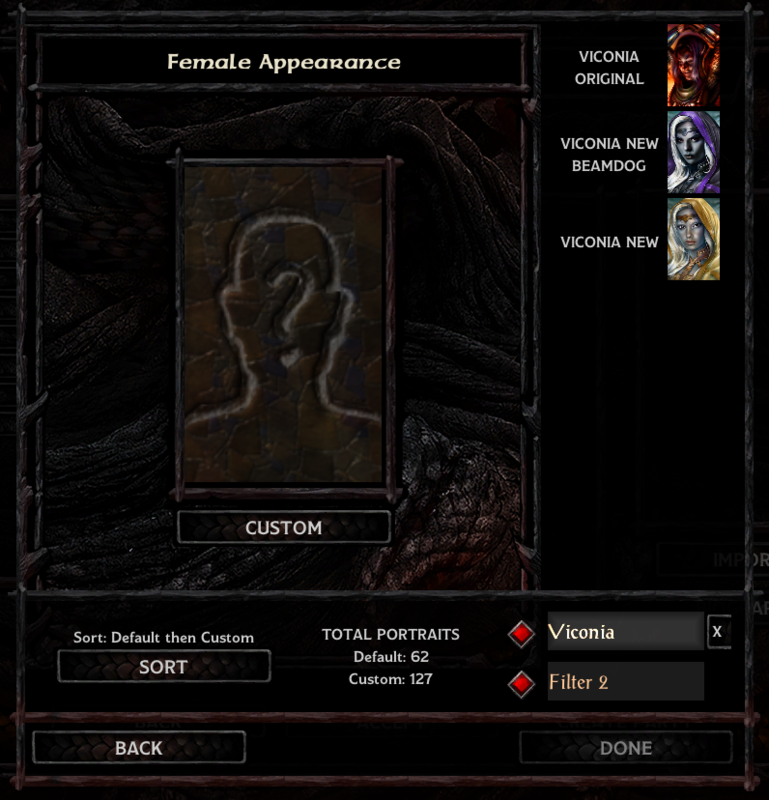 1) It now filters on Gender selected during character creation automatically. 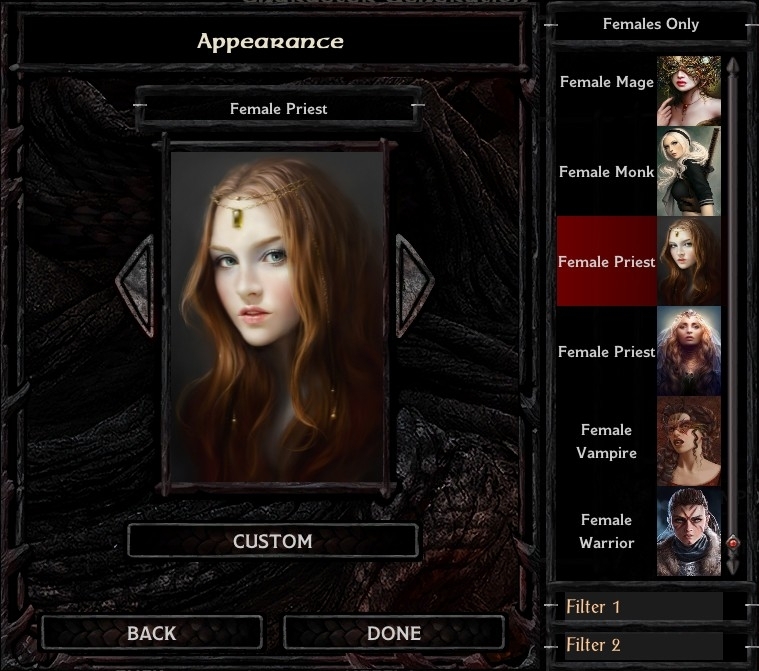 This filter is only applied during the character creation phase (just in case you decide to change gender later). 2) As you can see from Aedan's pictures, I moved the filter to the bottom and added a second filter which works in tandem with the first... eg you can search for Elf at the top and Mage at the bottom and you will retrieve all descriptions with both "Elf" and "Mage" in them. Ideally I'd like a couple more volunteers to give it a go, so I appreciate any support you can give. I can test it if you want, but I only have ~20 custom portraits. That looks fantastic! One of the bigger problems with the update for me is sorting through lots of portraits. I'm probably not technically savvy enough to be of much use as a tester (unless you want to make sure it's fully idiotproof) but will definitely be keeping an eye out for updates. @lefreut Hey - that's fine - and that would be great. There isn't a specific number needed for the mod, I just wanted to put it through it's paces and stretch things (eg try to break it) and a larger volume is easier for that. Consider yourself signed-up however! @Sids1188 - Also, not a problem - I wrote some instructions for setting it all up yesterday as I went through the process with @Aedan and so it would be a good opportunity to try them out. BOTH - I will message you shortly with all the details! By the way, which portrait packs are you guys using? Those are looking very smart (especially random man and random woman). Believe it or not, I don't use custom portraits however @Pecca @Aedan @smeagolheart may be able to advise. Those are looking very smart (especially random man and random woman). @Isandir is the artist that drew those portraits. BG2EE version is coming along too! I'm guessing the instructions worked ok, and you could follow them ok @lefreut ? Please message me any feedback or suggestions! First this look amazing I do hope Beamdog will implant something like that or this mod, so @Dee look what gem there is here. - Completed BG2EE setup - process is almost identical to BGEE + SOD and the same setup files can be used for both games with a few tweaks. - Nearly completed full instructions for installation. - I've added default portraits into my scollbar and removed the up/down arrows as these are no longer needed. - I've added a Sort button to sort the portraits as follows - each press toggles to the next option. - I've modified the layout slightly to just tweak the look and feel by game. - There is a bug when using the GENDER GIRDLE but there is workaround that you can use to fix this. - A minor bug exists if you scroll to the bottom and then filter, clicking out of the filter refreshes the screen and resolves. I've also been working closely with @Pecca - whose suggestions and input have been invaluable - and he will be using a modified version in the WIDESCREEN MOD as detailed in the OP. Thanks also to my testers @Pecca @Aedan @bengoshi @Sids1188 @lefreut @smeagolheart - If you are using an older version than you see below then the good news is that the format of the M_BG.lua regristraion file hasn't changed and I can provide you the new UI.menu code if you would like OR you can wait for the final release, your choice. A video here, and screenshots below. Well, that was pretty seamless... just updated to 2.2 and no issues... in fact, I didn't even have to remove the Infinity_DoFile to the extra lua file (although I have...). I'll be finalising things and then releasing very shortly I expect. Another little update - I'm still tweaking the look and feel, but now I added the ability to give descriptions to existing portraits too, this helps with searching and filtering. I love the searchability you added with this mod, but I think I prefer aesthetically the multi portrait mod with the matrix approach. I was wondering what your thoughts are on merging them. Multiple layouts with similar functionality would be interesting. Open question really. Probably I would do that myself. Could just be a case of an if-else incorporation around both ui codes where ingame we can set the toggle button to switch between the layouts. Thinking out loud here. Perhaps that allows for even more ui layouts in the future. @Iroumen - I'll have a chat with @BillyYank as I agree that the aesthetics of his solution are nicer... the gallery approach does have a better visual impact. Merging was my initial idea as well but some people may prefer your solution too. If maybe the filter is available for both ui layouts then you're done too. I guess it's probably best to check with @BillyYank to see if he can and/or plans to add sorting/filtering to his... I've looked at displaying the portraits in an array like his, and with my current knowledge I'm not sure how to do it (it's not simply a case of replicating his code as they fundamentally display the portraits differently). However, as he builds the array of portraits in each page, it might be possible to apply a filter at that stage thus giving the ultimate result... (I've sent him the details of how my filters works currently and a few suggestions of how it might be done). It's not the other way around? Build an array for everything, then filter and display the reduced set? As I understand it - Billy creates a page of portraits at a time from all portraits. So it would need to be filtered at the page level. My solution follows your logic and only displays the filtered results.